Want to create a unique van build but don’t know where to begin? First and foremost your van is where you sleep, so it makes sense to start with the bed! These campervan bed designs show creative and practical ideas for your van build. Whether you’re looking for a permanent fixture, or something with more flexible storage we’ve got you covered with inspiration from the simple and practical to the unique. When we first started out van build, storage was our main concern, so we built the bed high to fit bicycles underneath. Over time we’ve learned headspace was a greater concern for us and we ended up lowering the bed at least 9 inches. 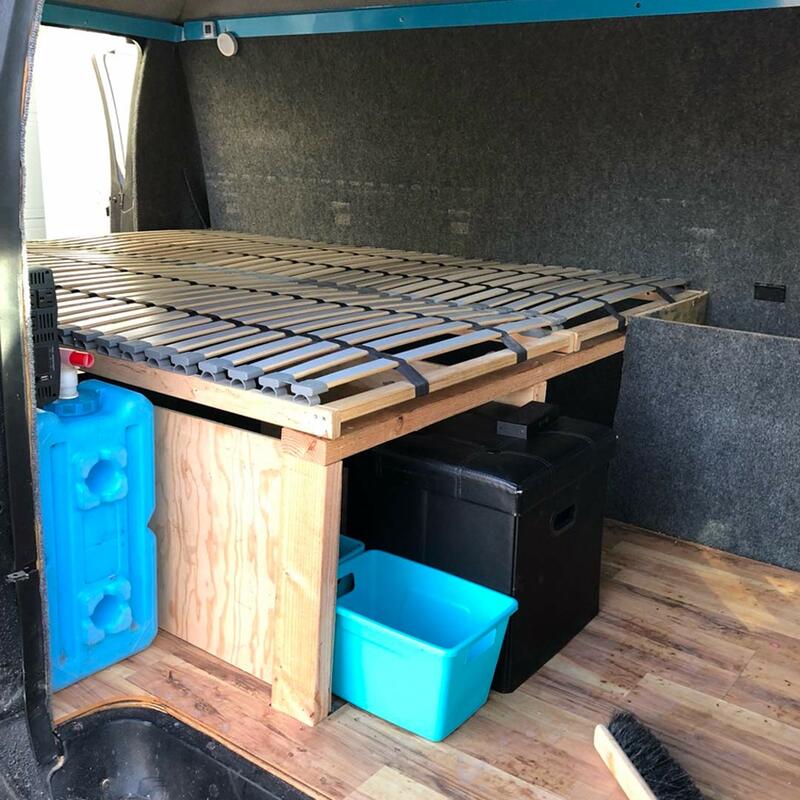 While looking through these builds by other vanlifers, be sure to keep in mind the layout and surface area of your van build. But don’t be too worried about making the perfect layout; If you find your needs change you can change your layout too! Like what you see? Read our post on which mattress to get and how to cut it! The platform bed is probably one of the most standard bed designs around, and the design we chose for our van build. A platform bed like this one provides ample amount of space underneath for storage. A platform bed has the advantage of being fixed in place so no work is required to set up or take down the bed each night. Keep in mind how much overhead space you’re willing to live with. We were able to purchase pre-made slats from Ikea for some extra spring cushion below our mattress. We also chose to purchase a short, 5″ memory foam mattress (queen size) to place on top. This bed was build into a 1996 Dodge Ram Van. @vanlife904 also built his campervan to include a platform bed. This allows for large storage drawers and space underneath. We’ve seen this design a lot, and it’s certainly a good way to get the most out of what little space there is in a van. This type of bed design allows for the dual purpose of both a bench cushion and a sleeping spot. @40hoursoffreedom uses this design in their 2008 Dodge Sprinter. It allows them ample room to work on the road as well as stay comfortable at night. Wanna make this? Read our post on which mattress to get and how to cut it! This is the first time we’ve come across this design. @jakeheard and @dannyogrds built a bench that flips open into this cool single bed design. All it needs are some cushions and it’s good to go! This bench would make a great space saver for someone who also needs an area to sit straight up on the road. One of the more unique designs we’ve seen is this slide out platform bed by @surftripping. During travel, the bed can be pushed flush against the back wall. Once you find a cool place to park, the whole platform can be slid out so you can hang out in the sunlight and sleep under the stars. @fitetravels is a family of three that needs space for everyone to sleep as they adventure in their Ford Transit. They’ve come up with an interesting way to fit all three beds in a van without it feeling too overcrowded. The bunk bed system hangs from the ceiling and has a little ladder to climb up at night. If you are into construction, this murphy bed by @rydawell might be perfect for you! This is one of the cleanest and most organized builds we’ve come across. It leaves an insane amount of space to fit bikes, surf boards or anything else you could ever want to travel with! The couch bed is a common solution for van lifers. There are a number of different ways a couch bed can be built. @dont_know_road used benches that fold down to hold cushions in place whether you feel like sitting up or laying down. Another common technique is the slider bed. This one by @heytess_ shows how you can push in the slats, and lift up the back to create seating. 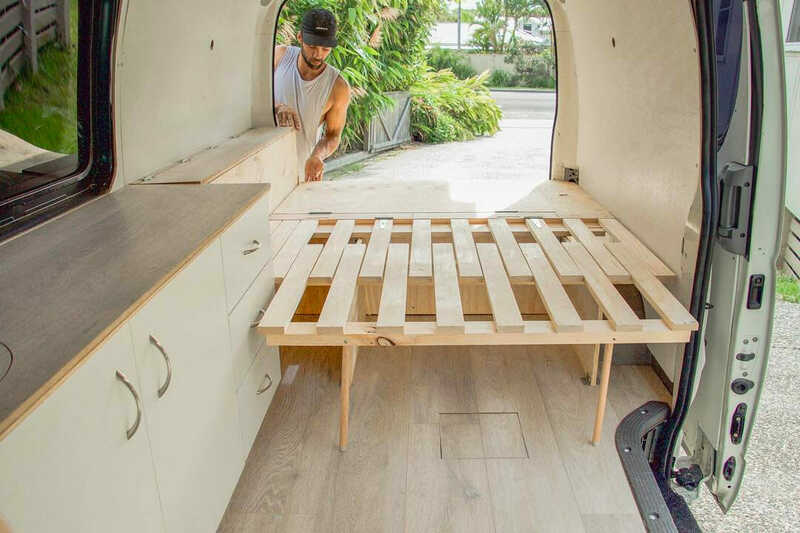 Slider beds make for a good multi-purpose solution when it comes to building out a van. With a minimal living situation, one option is to string a hammock across the inside of the vehicle like @thevoyagerproject has done to relax or even sleep at night. This hammock has been placed inside a bus, but it’s a perfectly reasonable solution if you enjoy the sleeping style of a hammock at night. Not everyone needs a perfect square bed, sometimes a different shape will give you the biggest bang for your buck. @a_hiace_called_home built an L-shaped bed to serve as both a permanent fixture, and a sleeping spot for two people. If construction is not your thing, don’t be discouraged! Simply throwing a mattress or ground pad on the floor along with a sleeping bag will work nicely. Not all vans need to be fully constructed, and using less wood will save on weight helping gas mileage in the long run. What Are Some Good Mattress Choices For Camper Conversion? Choose a mattress based on your available space and comfort level. We like the gel-infused memory foam because they are slim, breathable and easy to cut. Listed below are a few popular size options. King Modway Aveline Gel Infused Memory Foam 76 x 80 6"
Queen Modway Aveline Gel Infused Memory Foam 60 x 80 6"
Full Modway Aveline Gel Infused Memory Foam 53 x 75 6"
Twin Modway Aveline Gel Infused Memory Foam 38 x 75 6"
King Linenspa Gel Memory Foam Mattress 76 x 80 5"
Queen Zinus Cool Gel Memory Foam 60 x 80 5"
Full Zinus Cool Gel Memory Foam 53 x 75 5"
Twin Zinus Cool Gel Memory Foam 38 x 75 5"
Hey nice bed design! I really love how you were able to fit a bunch of storage underneath. Have fun on your adventure! I absolutely love this! We are going to build our van interior very soon, I think couch or slide bed will be the best option for us. You guys should check out VanDOits design. I have been staying in one and am for sure getting one.